1794 Anville Map of Ancient Egypt. WE SELL ONLY ORIGINAL ANTIQUE MAPS - NOT REPRODUCTIONS. Title: Aegyptus Antiqua Mandato Serenissimi Delphini Publici Juris Facta. Description: A large and dramatic 1794 J. 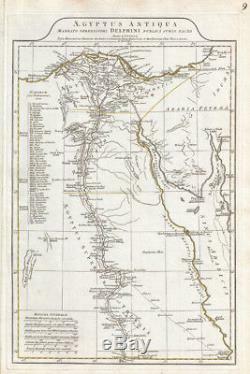 D'Anville map of Ancient Egypt Covers from the Nile Delta and Gaza south as far as Aswan. Details mountains, rivers, cities, roadways, and lakes with political divisions highlighted in outline color. Features both ancient and contemporary place names, ie. Thebae and Luxor, for each destination - an invaluable resource or scholars of antiquity. Identifies the Pyramids, Mount Sinai, Natron, Philae Island, the Cataracts, etc. Title area appears in a raised zone above the map proper. Includes six distance scales, bottom left, referencing various measurement systems common in antiquity. Text in Latin and English. D'Anville in 1762 and published in 1794 by Laurie and Whittle, London. Size: Printed area measures 20 inches high by 12.5 inches wide. If your address is a P. DHL International EXPRESS (45 USD). We do not offer this service. Antique Map Restoration: Geographicus can repair and restore your antique map. Services include deacidification cleaning flattening and backing. The item "1794 Anville Map of Ancient Egypt" is in sale since Friday, November 23, 2018. This item is in the category "Antiques\Maps, Atlases & Globes\Africa Maps". The seller is "geographicusmaps" and is located in 11221. This item can be shipped worldwide.